Christopher Columbus probably used the map above as he planned his first voyage across the Atlantic in 1492. It represents much of what Europeans knew about geography on the verge discovering the New World, and it’s packed with text historians would love to read—if only the faded paint and five centuries of wear and tear hadn’t rendered most of it illegible. But that’s about to change. A team of researchers is using a technique called multispectral imaging to uncover the hidden text. 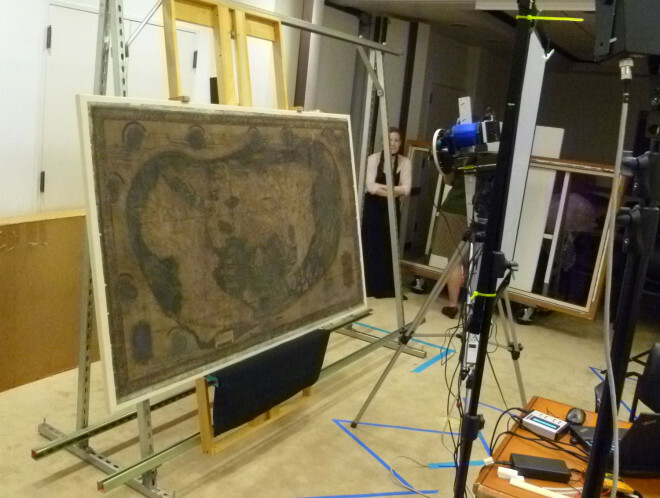 They scanned the map last month at Yale University and expect to start extracting readable text in the next few months, says Chet Van Duzer, an independent map scholar who’s leading the project, which was funded by the National Endowment for the Humanities. The map was made in or around 1491 by Henricus Martellus, a German cartographer working in Florence. It’s not known how many were made, but Yale owns the only surviving copy. It’s a big map, especially for its time: about 4 by 6.5 feet. “It’s a substantial map, meant to be hung on a wall,” Van Duzer said. The Martellus map is interesting for several historic reasons, Van Duzer says. One is it’s relevance to Columbus. 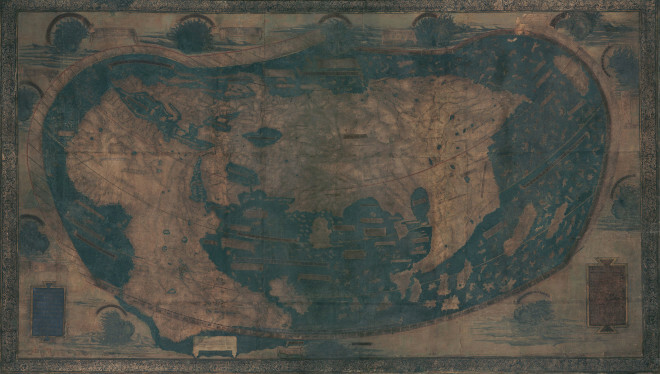 “It’s extremely likely, just about unquestionable that Christopher Columbus saw this map or a very similar one made by the same cartographer, and that the map influenced his thinking about the world’s geography,” Van Duzer said. There are several lines of evidence for this, Van Duzer says. Columbus sailed west from the Canary Islands hoping to find a new trade route to Asia. 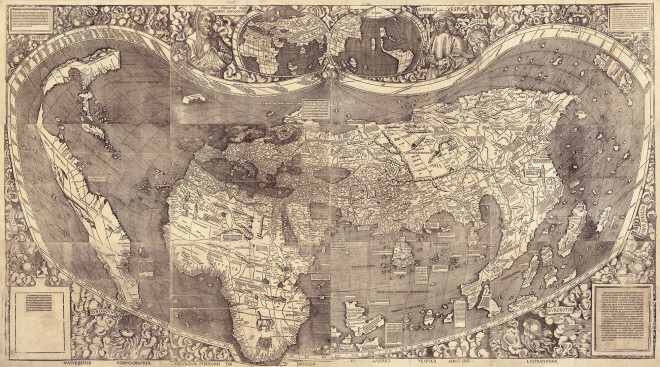 Writings by Columbus and his son suggest that he began searching for Japan in the region where it appears on the Martellus map, and that he expected to find the island running north to south, as it does on the Martellus map, but not on any other surviving map made before his voyage. (You can see Japan floating too far off the coast of Asia in the top right corner of Martellus’s map above). Of course, what Columbus found instead was something Martellus hadn’t known about—the New World. Most of the text still isn’t legible in those older UV images, but some of the parts that are appear to be drawn from the travels of Marco Polo through east Asia. There are also indications of where sailors could expect to find sea monsters or pearls. “In northern Asia, Martellus talks about this race of wild people who don’t have any wine or grain but live off the flesh of deer and ride deer-like horses,” Van Duzer said. Waldseeüller copied much of this. There are also interesting differences between the two maps. Waldseeüller gets the shape of Africa more or less right, but on the Martellus map, southern Africa juts out way too far to the east (Africa is on the left side of both maps). In addition, Martellus’s depiction of rivers and mountains in the interior of southern Africa, along with place names there, appear to be based on African sources. It’s likely that this information came from an African delegation that visited the Council of Florence in 1441 and interacted with European geographers. Three other surviving maps contain some of this same information, but the Martellus map covers more territory than any of them, making it the most complete surviving representation of Africans’ geographic knowledge of their continent in the 15th century. “In my mind, that’s absolutely amazing,” Van Duzer said. Van Duzer hopes to learn more about Martellus’s sources from the new images the team is creating. Scanning the map only took a day, after two and a half days of set up, he says. The team used an automated camera system developed by a digital imaging company called Megavision. The system uses LEDs to deliver light within a narrow band of wavelengths and minimize the amount of heat and light the map was exposed to. The camera has a quartz lens, which transmits ultraviolet light better than glass. The team photographed 55 overlapping tiles of the map, using 12 different types of illumination, ranging from ultraviolet to infrared. When the project is complete, probably sometime next year, the images will be available for scholars and the general public to examine on the website of theBeinecke Digital Library at Yale.